Gerry Gdowski completed 12 of 15 passes for career highs of 225 yards and four touchdowns as Nebraska topped archrival Oklahoma, 42-25. In leading the Huskers to their most points ever against the Sooners in Memorial Stadium, Gdowski set a Nebraska season record with 204.6 total-offense yards per game. I-back Ken Clark, meanwhile, became the 11th player in Big Eight history to top 3,000 rushing yards, finishing at 3,037. 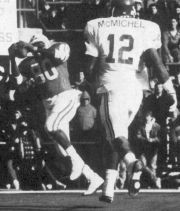 The win was the Huskers' 103rd in the 1980s, tying Alabama's NCAA record for wins in a decade.